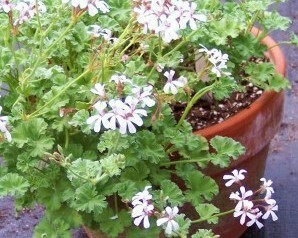 Nutmeg Scented Geranium (p. fragrans) - Small rounded grayish green leaves have a delightful spicy nutmeg scent. Sprays of dainty white flowers when in bloom. Rounded, compact and trailing habit make this a good choice for containers and hanging baskets. Like all pelargoniums, requires a well drained soil and sunny location. Good for culinary and tea use. Perennial zones 10-11+ Live starter plant in 3 inch container.